A peaceful period followed 208 Squadron’s departure from the Suez Canal Zone, when it re-located to Ta Kali in Malta, where it remained until 1958. On 29th June 1953, the 39th was scrambled to counter a North Korean attack on one of these air lifts. During this engagement, Flight Lieutenant John Granville-White shot down one MiG-15 and scored another, unconfirmed, kill”. 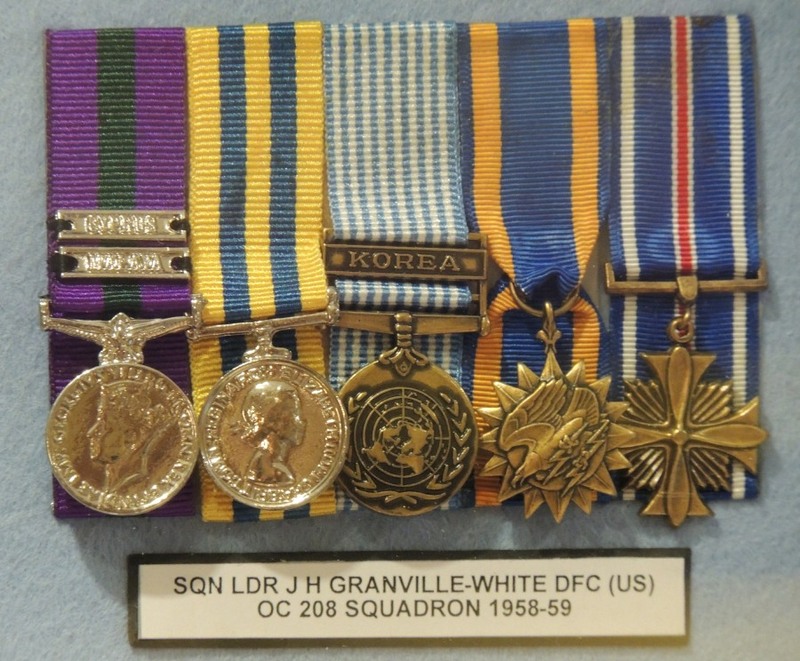 In the fierceness of that air combat and for his tenacity against the enemy, Flt Lt Granville-White was awarded the United States Air Force Distinguished Flying Cross, one of only fourteen awarded to foreign recipients, having already been awarded the US Air Medal. 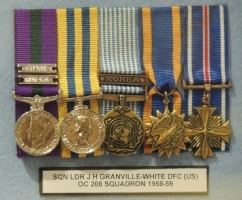 The standard pair of Korea campaign medals, the British and UN issues, plus the Cyprus clasp to the GSM, complete John Granville-White’s medal set. During this period, the Eoka crisis in Cyprus was building up and it was decided in government circles to form a new 208 Squadron, equipped with the Hawker Hunter F6, to be based at Nicosia in Cyprus. The Squadron Commander of the new Hunter-equipped 208 Squadron brought a most interesting medal set to this display. Sqn Ldr John Granville-White first flew reconnaissance Spitfires in the Far East and so received the GSM for the Malaya campaign. He was then seconded to the US Air Force and flew an F-86 Sabre in the Korean War. As the US Forces were moving out of Korea in preparation for the August 1953 armistice, there were major air lifts taking place out of Kimpo. The 39th Fighter Interceptor Squadron was based at Kimpo and John Granville-White was part of that squadron. 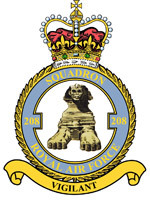 While the Squadron was based in Cyprus, the Jordan crisis of 1958 arose and six Hunters of 208 Squadron were detached to Amman to uphold the monarchy there. So grateful to the British Forces Jordan (“Britforjor”) was King Hussein that he wanted to award a medal to mark the event to all British servicemen who had served there. It was to be forty years before that medal was struck.